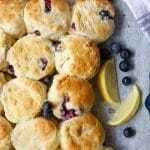 These deliciously simple Super Easy Blueberry and Lemon Scones make a fabulous morning tea or addition to the lunchbox. They come together in no time at all and taste amazing. In a large bowl mix in all the ingredients except the reserved flour. The mix will be quite sticky. On a clean bench, add a thick layer of most of the reserved flour and spoon the mix on top of the flour. Sprinkle some more of the reserved flour over the top of the dough. Working with your hands, quickly and lightly knead through the flour so the dough becomes more workable. This should only take a minute or so. Shape the dough into a rectangle about 1.5 cm high and cut into even portions with a knife or scone cutter. Arrange the scones on the prepared tray and lightly brush each scone with milk. You may notice that the inside of the scones is still a little sticky while cutting, that is fine. You are just wanting the dough to be a consistency that you are able to shape and cut.